Here are some photos showing the current conditions. The steep chute above Iceberg Lake was more difficult than usual, due to the low snowfall so far this year. Mescalito, thanks for posting the link to the pictures. This one looks particularly bad. I realize it is below Lower Boy Scout Lake, but is it above the point where summer hikers climb to the Ebersbacher Ledges? I assume before that point, you could follow the summer hiker route pretty well. The snow shoes look like trouble here... Were they advantageous more of the time? Please thank Phil H for posting his pictures. Steve, about the photo that shows me crawling over the willow branches: the location was well below the start of the E-ledges. 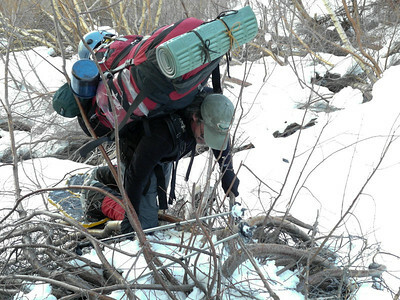 Without snowshoes, we would have post-holed even deeper. In the photo, it appears that I could have walked around the willow branches, but I tried that and it didn't work. There were some shallow snow bridges over running water that weren't strong enough to support my weight. Thank you thank you thank you.. Our trip is still a month away but these images are priceless. WildTurkey: good luck on your trip. Conditions could change a lot over the next few weeks, so I'd suggest checking out this message board, and the WPS message board frequently. According to my friend who works for NOAA, this has been one of the driest winters in many years. We had pretty good snow conditions between 9500 feet and 13000 feet, but below and above those elevations, there were several rocky sections. So I have had a little change of plans, I am going up with one buddy of mine to try and tackle the MR in a day (last week of April). Anyone do this lately? We will be bringing emergency shelters just in case. looking into getting a climbing harness.. any suggestions? Any features I should look for? The end of April should be easier. But Richard is quite experienced, and knows the route better than most. Hello everybody, Its been a long time since ive been here. Life is so busy anyways im glad to be back. So the link to the pictures is not working. Im curious about the weather in whitney right now? is snow gear needed for the main route up, the whitney portal? John: the SmugMug website was down for a while, but it's working again. As you probably know, there's a major storm passing through the Sierra right now. So conditions will be much different than they were two weeks ago, when my group was there. If you're heading up there within the next couple of weeks, most likely you'll need snowshoes, poles, ice axe, crampons, etc. Also, it's possible that you'll have to hike an hour or two, just to get to the trailhead. I revisited the website and it is working now. The photos are amazing and im glad you had such a great time. I was thinking about heading up before my date of june 12 but i might just wait. My father has a cesna airplane and said he would take me to fly over the area to get a feel for the route which I thought would be cool.If i can get away from the wife and kids i just might head up later for a day hike but I want to save the summit for my trip planned for june 12. What is the conditions like in June? > What is the conditions like in June? 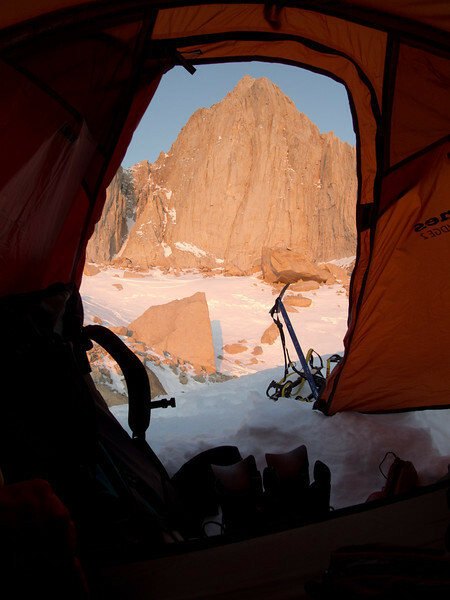 Last year was a heavy snow year, and in June, everyone was using ice axe and crampons, and skipping the switchbacks. This year, unless things change a whole lot, the trail will likely be nearly dry in June. Trying to figure out if my sleeping bag is going to cut it, have a 20Degree bag and a 15 degree liner.. what rating was you sleeping bag, and did it do the trick, going up last weekend of this month. I used a zero-degree sleeping bag, and stayed warm enough. As long as your 20-degree bag is from a good company (Marmot, The North Face, etc. ), you should be fine if you use a liner. You can also wear extra layers at night, including your down jacket, if necessary. Awesome photos and great descriptions.. too bad we couldn't get this good of information weekly. I've never done Whitney but I do Yosemite and I had a 30 degree down from marmot and it wasn't warm enough in Yosemite which was above 30 degrees. I just bought a 0 degree marmot lithium membrane which is perfect for almost any trip.marmont came out with a new way to actually test a sleeping bags true warmth rating. The lithium has been tested with it. Most sleeping bags are not tested with this technology so it's less likely that a bag rating won't be accurate. For your trip I'm sure you'll be ok with liner but one day I woul invest in a expensive one from marmot who has a wanderfull warranty. Generated in 0.368 seconds in which 0.277 seconds were spent on a total of 14 queries. Zlib compression disabled.